You can’t just create your own Pantheon as soon as you make it into the game. You will have to get through the initial training and a set of beginner quests, although it won’t take you too long. It will also require you to spend 50000 credits, so it might be a little while, unless you buy some with argents right of the bat. 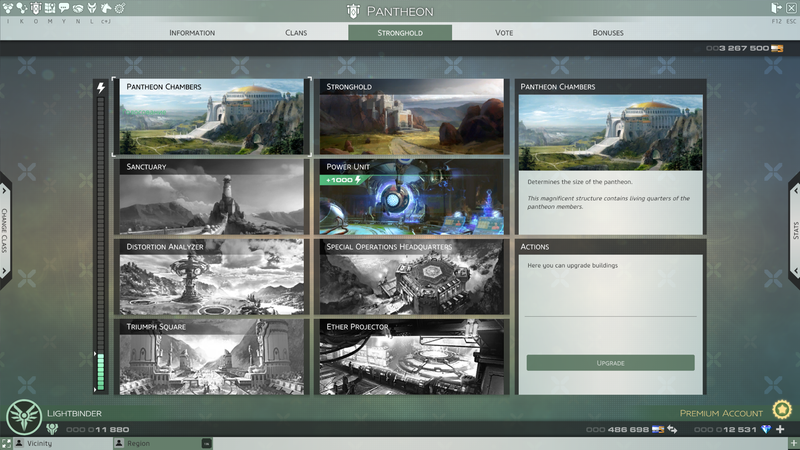 If you are not a part of a pantheon yet, but you want to create one, make your way to the Pantheon page (press ‘O’). Here you will be offered to input the name of your pantheon. Be aware that if in 7 days your pantheon will not recruit 2 additional participants (to be your first commanders), it will be disbanded. If you are looking for a pantheon you should first check out Hall of Pantheons in Aelinet, and pick one that you like. But if for some reason Aelinet will not open (it happens sometimes), you can check it out at the official website, under ‘Community’ -> ‘Forums’ -> ‘Hall of Pantheons’, which will allow you to see the same thing, just with a few more clicks. You can also check out ‘Communities’ via Aelinet as every Pantheon also has one. Pantheon tab includes following sections: Information | Clans | Stronghold | Vote | Bonuses. Each of them is important as it shows different aspects of Pantheon management. 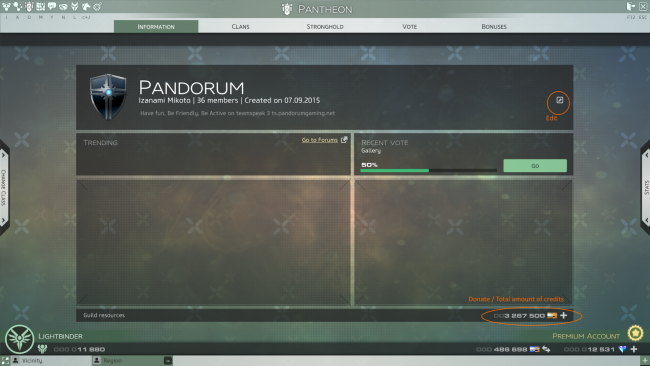 Regular Pantheon members will not be able to access interface of ‘Stronghold’ and ‘Vote’ tabs. It is reserved for the Commanders. Below I will go through every tab of the Pantheon interface. First thing you see after joining a Pantheon/opening Pantheon page will be Information tab. At the top you’ll see Pantheon name, and below it the name of the Founder, number of people in the Pantheon and the date at which your Pantheon was created. Below that you have a status bar. Usually there will be some sort of important information / guild motto. Commanders can edit the status by clicking on the pencil icon. Left section underneath the top one is reserved for the most popular topics of the Pantheon Community. There you will also see a link to visit the Community. Unfortunatelly it is broken on NA version at the moment. Right section reminds Commanders about recent Votes, be it promotion of a fellow immortal or construction of the new building or demotion of an inactive Commander. The bottom bar reflects a total amount of credits your Pantheon possesses. Those credits will be used in upgrading your Pantheon’s Stronghold. Players are encouraged to donate, as it greatly helps to the Pantheon and is one of the most effective ways to collect Myrrh Drops, which I will talk about later. What is different about Skyforge Pantheon system is that Founder is no different from Commanders, they all have same rights and responsibilities, they all can start buildings, move people around, kick and promote. There even is no special title for the Founder. The only difference about Founder is that nobody can vote him off the island. This tab includes: top bar with the different clans, left big section with the list of members of the current clan, right upper section with information about a certain clan member and right bottom section which allows commanders to manage the clan. Top bar is pretty obvious; it allows you to browse different clans. Minimal number of clans is 3, maximum possible is 20. A little star marks the commander of this clan. If you are a Commander and are currently viewing your clan, you will see ‘Invite’ button. This is one of the ways to invite people to your clan. If you do not see it there, your clan is full. On the bottom of this section you will see current number of clan members/maximum number of clan members. If the clan does not have a Commander, the system with automatically reserve a single spot for him/her. So a clan without a Commander can exist (if your Founder is an authoritarian type) but note that it will always be weaker. Also if you will try to move someone into such clan, the person you are trying to move will swap places with a random person in the commanderless clan. You also cannot move anyone in or out of the clan that has Vote for a Commander in progress. Right upper section will tell you information about a selected person. What classes are available to him/her, and, most importantly, how much credits he had contributed to the Pantheon. It will also allow you to invite this person in the group without any hustle. Right bottom section is a management section. Select a clan member in the left section and you will see options to promote/demote or move/kick person from the clan. Note that promotion and demotion require a Vote among the existing Commanders, and only a Commander of the clan can kick a person in his own clan. But you can still move a person to your own clan and then kick. Don’t forget to click ‘Save’ button for changes to appear. This tab will allow the Commanders to evolve Pantheon. You can expand your Pantheon by either building more clans (Conference Hall) or allow more members per clan (Gallery). Expansion of Pantheon’s power is accomplished through building and expanding the Citadel, which includes Academy (required to build Power Unit, Triumph Square, Ether Projector and Distortion Analyzer). Fort includes Special Operations Headquarters and Sanctuary. Any Commander can activate the building. After pressing ‘Upgrade’ button a Vote will be initiated. Commanders will decide the necessity of a current upgrade, but to build it you will require credits and resources. Credits will be taken off the Pantheon immediately, and resources will be collected via Pantheon Mission of the Order. Pantheon mission will have a different icon, which looks like a blue square shield, and can only be completed every 8 hours. No amount of refreshing the list with credits will bring it back. 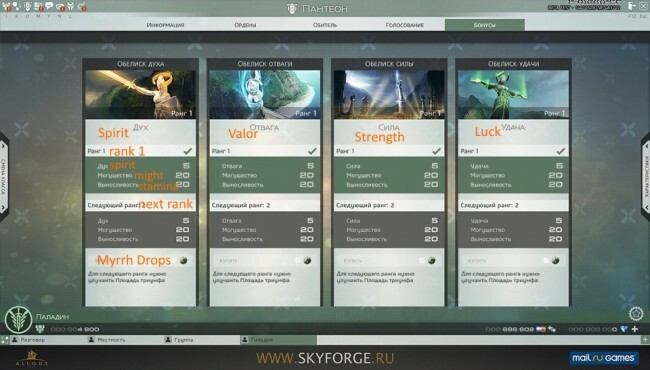 Note that you will need Engineers to get the highest success rate, but if you have 1 or none at all, you can send Mystics/Templars with them, as those Adepts are able to reduce the difficulty of the task. When you create your Pantheon you have 3 clans with 3 members per clan. You can expand it up to 20 clans with 20 members per clan, to a grand total of 400 people. Though it will take quite a few credits/resources to get there. 9th clan will cost you about 1250 resources and 500000 credits. But the upgrade of the number of clans has the same cost as the upgrade of the number of members per clan of the same tier so the best way to expand is to alternate between them. Special Operations Headquarters is a building that sells Modificators for your Adept missions. 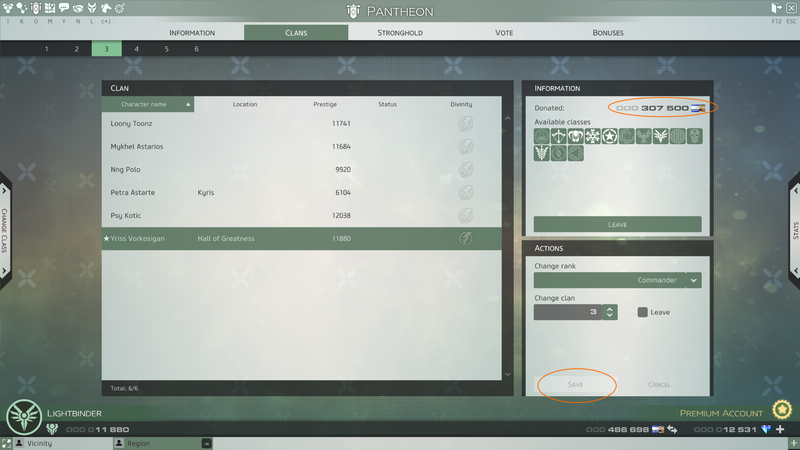 Modificators will appear on the Market (press ‘N’) under ‘Pantheon’ tab. Be aware that SpecOps HQ will cost you 1 500 000 credits and 2500 resources. Academy will allow you to participate in Invasions and Anomalies, and it also gives you ability to acquire bonus talents. Triumph Square will allow you to purchase bonuses with Myrrh Drops, Distortion Analyser is required to detect Anomalies and put them on the map in the Divine Observatory. Similarly Ether Projector will inform you about the upcoming Invasions. Distortion Analyzer and Ether Projector also it will allow you to have special talents that work only inside of the Anomalies and Invasions. Despite Power Unit being a part of the Academy, I want to mention it specifically. It is the heart of your Stronghold. Without Power Unit a lot of the buildings will not work. Initially Power Unit will take 2 000 000 credits and 3400 resources to build, but it will only produce 1000 energy points, while energy consumption of different buildings varies greatly: Triumph Square will take 4000 energy, Sanctuary will take 3000, everything else will take 1000 a piece. This tab will allow Commanders to say their word on different matters: who will be the next clan’s Commander? Who will have to go? What to build? Is it worth it? It is quite important! And that’s about it. Currently this tab has a very limited functionality. It will also allow the rest of the Pantheon members to observe the vote. After you change status of a person in the ‘Clans’ tab or start a construction in the Stronghold, the Vote will automatically appear. You can only say ‘Yes’ or ‘No’ to the Vote. You will require over 50% support to start anything. But note that in 3 days those Commanders who didn’t vote will be considered as voted ‘Yes’. Also this tab displays history of the votes, and you can see who initiated the vote and was it a success of a failure. Ah. The mysterious tab that tells you to go and build the Triumph Square. You then look at the requirements, sigh and go back to farming. Unfortunately not much is yet known about it, but the bonuses will appear as Obelisks of Spirit/Valor/Strength/Luck. Those Obelisks will give bonuses to the correlating stat to EVERY member of your Pantheon. Upgrading the Triumph Square will result in a bigger bonus. You can purchase the bonuses with Myrrh Drops (which I mentioned earlier). The only way to give your Founder status away is to leave the Pantheon. In that case the Commander/Founder status will be given to a random person within your clan. If you want to give the role to a specific person, the only way to do it is to move everyone else out of the clan and then leave. The king is gone, hail the king! The Community is like a Facebook group. Update status, post news, share cute cat pics. Founder acts as an admin. He doesn’t have to do it all alone, as he can assign moderators. He can also make threads to be visible to people with only certain Prestige level (in the editing find ‘Prestige’ button). Also here, in the Aelinet you can view information on clans, much like the Pantheon Clan tab. This information can be accessed only by Pantheon members.